With VOCAL’s proprietary techniques, GSM speech coders are optimized to support modern processors including DSPs and conventional processors from AMD, Intel, ADI, TI and other vendors. Benchmarks have shown that our highly optimized C with limited assembly code compares well against other vendors software. Although these implementations typically require significantly more assembly language, the difference in performance is within a couple of MIPS. More importantly, the portability and maintainability of our designs benefit our customers by lowering the initial costs, easing integration, reducing maintenance costs (fewer code changes when upgrading compilers), and providing greater availability of optimized code for a range of different modern processors. Contact us to discuss your application requirements. The mobile telephone industry has standardized a number of Global System Mobile (GSM) vocoders over the years for use by handheld portable devices. Most of the common ones were developed by the European Telecommunications Standard Institute (ETSI) under the GSM set of standards and then deployed world-wide (with notable exceptions in the United States). These speech compression algorithms were greatly limited by the processing power/battery life in early handheld devices and very limited digital channel capacity over the air. Later speech quality/intelligibility improvements resulted from greater signal processing capability in the handheld devices. When interoperating between networks, most mobile carriers simply convert their encoded voice to the traditional G.711 μ-law and A-law representations even when the non-mobile subscriber is serviced by another carrier or by a Voice over IP (VoIP) service. This results in unnecessary quality degradation which may be considered part of the walled-garden plan. 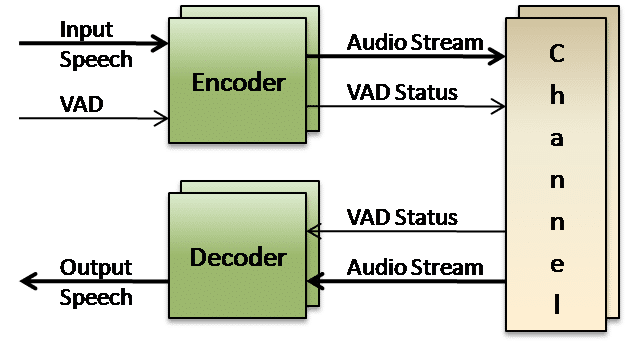 New developments in advanced wide-band speech coders have begun to improve this situation especially when a carrier crosses the boundary between wireless and some sort of wireline replacement service. VoIP services, such as Skype, already carry speech signals (iLBC_encoded) between mobile and all other end-points without the need for additional decoding and re-encoding.